I always get excited when I find new products or when others share new products with me, and I love to incorporate these new products into different recipes! When I was at the local Walmart last week, I found Quaker Oatmeal Squares® in Cinnamon flavor and knew exactly how I was going to use them to recreate some of my favorite flavors into a new recipes. These Quaker Oatmeal Squares® as well as other Quaker Real Medleys®, Quaker Simply Granola®, and QuakerLife Cereal® products can all be found in the cereal aisle, and you can find the products here at Walmart. For me, and many that live in New Mexico, biscochitos are usually only made and eaten during the holidays and special occasions. Biscochitos are traditional cookies that are flavored with cinnamon and anise. The two flavors are subtle yet complement each other perfectly; it's no wonder that it's the state's official cookie and our favorite cookie! These cookies, however, are time consuming to make so I only make them a couple times during the year. I did find a great way to incorporate biscochito flavors that you can incorporate into your every day life-- I've created a flavorful Cinnamon Anise Granola recipe that is reminiscent of my favorite cookie! This recipe is not nearly as time consuming to make as the cookies are, and you can savor the cinnamon and anise flavors of biscochitos every day in many different ways! I used pecans, pepitas, and pine nuts (which are some of the most commonly used nuts here in New Mexico) but you can mix in any of the types of nuts that you prefer. 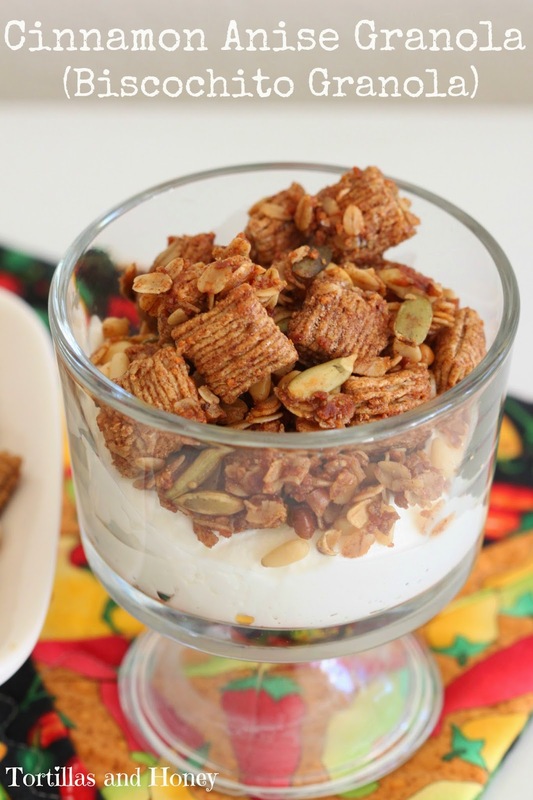 There are several ways that you can eat this granola! You can eat this for breakfast (make yourself a yogurt parfait and sprinkle on top of greek yogurt or you can turn this into a cereal where you can add milk or soy/almond milk); use this granola as a snack by itself or you can sprinkle it on a rice cake that has peanut butter spread on it); or you can use this in your dessert and sprinkle this on top of vanilla or honey ice cream for dessert! This granola is very versatile that you can use in several different ways. Preheat oven to 250 degrees. Line a large cookie sheet or jelly roll pan with aluminum foil and spray with nonstick cooking spray. In a large bowl, combine all ingredients EXCEPT for oil, honey, and salt. In a medium sized sauce pan, over medium heat, mix together oil and honey. Stir the mixture until it is heated through and just before it boils. Drizzle the honey/oil mixture into the dry mixture and stir together until completely combined. Spread the granola into the pan in a thin layer. Sprinkle lightly with kosher salt. Bake for 20 minutes, then remove from oven and flip with a spatula. Bake for an additional 20 minutes. Be careful not to overbake; the granola may look undone but it will dry out and harden a little when it cools. After the granola is completely cooled, break up into chunky pieces and store in an airtight container in the fridge until ready to use. This granola is soooo tasty and unique! I've never had biscochitos but it sounds like I'd love 'em! What a beautiful simple and unique granola! I love it! I have never had biscochitos before but they sound fantastic! My dad was Italian so I am a sucker for anything anise. I've never thought to combine it with cinnamon but now you've got my wheels turning! Thanks for the great recipe, Renee! This looks so yummy looks like something I can get into but what is peptias. 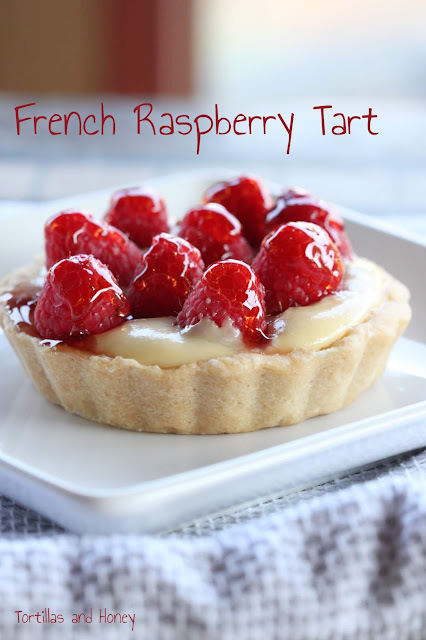 What a great recipe Renee! You know, I love the flavor of biscochitos, but not the texture. The lard just doesn't settle with me very well. I love that you created a recipe that gives you the flavor, but no the fat. Ingenious! Can you use something for the binder besides powdered milk?